Adobong Atay with patatas and egg for the win! 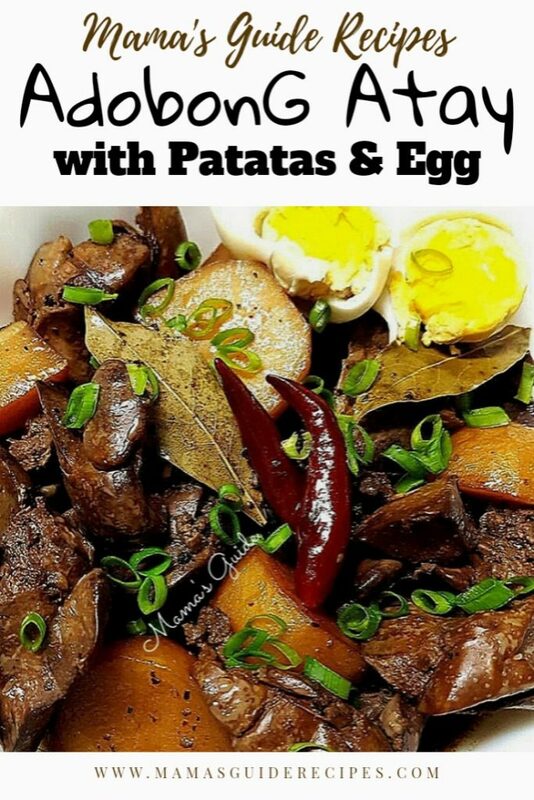 Or also known as Chicken Liver Adobo with Potatoes and Boiled egg is super tasty. Just a cooking tip, you have the option to marinate it for 1 hour or longer so the soy sauce is absorbed well in the meat. We all know well that the longer it sits the better. Nevertheless, if you got no time to do the marination its ok anyway. In a sauteing pan, heat about 2 tbsp of cooking and saute garlic and onions until fragrant. Add in sliced potatoes and stir fry for a minute. Follow in the pan the chicken liver and stir fry for 3 minutes at high heat. Lower the heat to a medium low and add about 5 tbsp of soy sauce and 4 tbsp of vinegar. Add 1/4 cup of water and about 2 bay leaves and simmer for 5 minutes, lid closed; until almost all liquid has evaporated. When almost all liquid has evaporated, have a taste and if it’s too sour, add in 1/2 – 1 tsp of white sugar. Add siling labuyo and stir fry for another minute and remove from heat. Garnish with chopped spring onions and sliced boiled eggs. Notes: Do not overcook the liver. Chicken liver can be bitter when overcooked.